Hello All! Did you all remember to enjoy some ice cream today? you know today right? National ice cream day! YAY! Ok, yeah, I spaced on it too. Well, I mean, it was hard to miss if you were online, but I was offline. See, weekends are when I try to get caught up on all my parental / homeowner type responsibilities, important stuff like playing wiffle frisbee [my son didn't feel like catching the frisbees, so he was swatting them out of the air with his wiffle ball bat]. During these times I tend to be offline a lot. In fact, I tried to be offline more than usual this week to do a little experiment. My attention span is short enough as it is without it being torn asunder by social media and other internet distractions. Ok, yeah, see what happens when I go offline? Sentences like that happen. 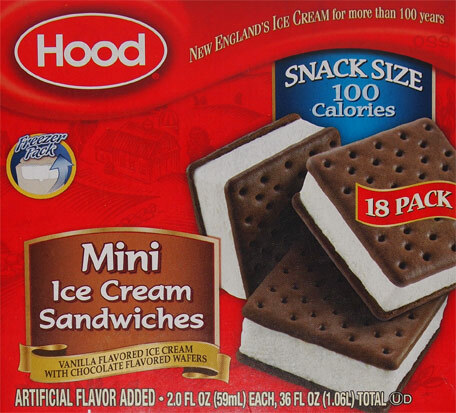 Have no fear though, the day was not ice cream free, but instead of our usual bowls of ice cream, we made short work of these Hood Mini Ice Cream Sandwiches. It's a standard vanilla flavored ice cream with chocolate flavored wafers... it's just half a sandwich. With standard ice cream sandwich white paper wrapping removed... do you see what's different? Think about it for a second, something doesn't look right does it? Something is making this treat look bigger, have you figured it out yet? It's the holes! There's more than on a regular sandwich. Ahhhh, someone is patting themselves on the back for that one and I'm not going to stop them. It does make the treat seem bigger than it is. It's a nice touch. How is it? Fairly standard. 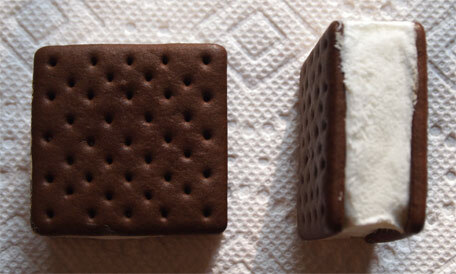 It's a mild flavored ice cream in side chocolate wafers like most every other sandwich you've had. The only real difference is that the wafers are a bit more solid then I'm use to it. I'm not sure if it's this box or they've done it on purpose, but I prefer that bit of softness to the wafers. There's almost a crunch here. I will pick up another box at some point to verify this isn't a fluke. And there you have it, my weekend is done. New Nosh Show tomorrow and then Nick has one very tasty gelato for us on Tuesday. Rest well everyone, a new week starts tomorrow!